Editor’s note: This story marks the return of former Streetsblog San Francisco editor Bryan Goebel, who will be contributing occasional pieces. Bicycle advocacy can be an especially daunting challenge in the South Bay and the Peninsula, where car-centric policies and culture rule the day. At this week’s Silicon Valley Bike Advocacy Summit the focus was on improving relations between advocates and government officials at a time when a growing number of cities in the Silicon Valley and big companies such as Facebook, Google and Apple are starting to embrace the bicycle. Although there are no official counts on the burgeoning numbers of people who ride bikes in Silicon Valley and the Peninsula, Winter said it’s evident on the streets, especially in San Jose. “Bike culture in San Jose has been growing really rapidly. It started with a lot of folks in the fixie crowd, and now I’m seeing more folks riding the Dutch-style bikes around town,” said Winter. The popularity of the San Jose Bike Party has been another indication. Just last week, the San Jose City Council unanimously approved six bike projects that will add 8 miles of new bike lanes downtown. Five of the projects will include road diets and lane reductions, and many sections will include bike lanes with extra space between motorists and bicyclists, said John Brazil, who heads up the city’s bike/pedestrian program. The projects are expected to be completed by the end of June. There was no opposition to the removal of vehicle lanes and that came as a surprise to the city’s Transportation Director, Hans Larsen, who also attended this week’s summit. At the summit, veteran bicycle advocate Randy Neufeld gave an inspiring opening keynote, telling the crowd that advocates must go beyond engaging individuals, and create a true coalition that involves all segments of a city’s political power structure. This year’s 150-plus attendees included a number of mayors, elected officials, public health professionals and advocates interested in sharpening their skills. The SVBC relies heavily on volunteers to advocate for better bicycling infrastructure and smarter planning within the region’s 40 jurisdictions. Winter said one of the most significant outcomes of the summit was bringing together law enforcement officials and advocates for a closed-door session on how to deal with group bike rides “that have created animosity on both sides” in places like Woodside, Portola Valley and Los Altos Hills. “There was a real sense of ‘yes, this is something we want to work on, let’s keep meeting about it.’ We didn’t come to any conclusions. It’s a big topic and it’s going to take awhile. But there was a commitment to enter into that process,” said Winter. Winter said SVBC’s biggest priority is to work on adding and improving bike infrastructure. “We’ve really tried to organize the coalition more and start local teams in three communities up and down the Peninsula. 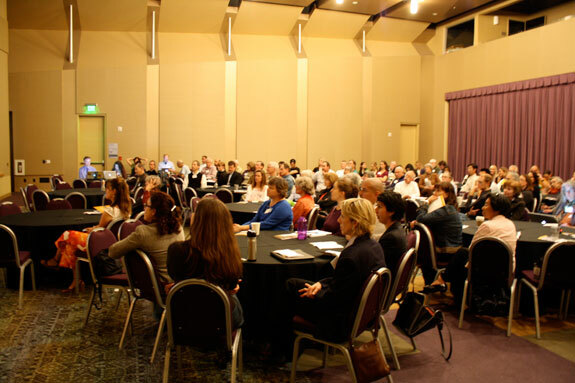 So, we have membership groups who meet in San Jose, Palo Alto and Redwood City on a monthly basis and we’re leveraging our volunteers on the local level to find out exactly what is relevant on the infrastructure level,” she said. I’d rather we talk about “allowing people to walk and bike” since that’s a more accurate statement. It’s wonderful to see progress in Silicon Valley, a place whose creativity, ingenuity and financial resources make it potentially very important to the movement, locally and globally. I posted up my before-and-after visualizations of San Fernando St with green lanes here. Congrats to SVBC for a seriously fun (and informative!) summit. The speech by Honku author Aaron Naparstek about changing the world through humor and social media was worth the $20 charge of the entire summit! Kudos to SVBC Staff for assembling a first rate cast of speakers and participants – all whom seemed to want to roll up their sleeves and get goin’ on making cycling truly viable as an alternative means of getting around! The Silicon Valley Bike Vision report shows what peninsula cities are doing right, as well as what they could do better to improve conditions for bicyclists and encourage more people to ride. It serves as a vision of what bicycling could be like, and provides a general roadmap on how to get there.